Do you want to keep going through life with the same generic flavors? MUTANT doubts that you’d want to drop hard earned money on a chocolate that tastes like everyone else’s, or a vanilla that was flavored by the lowest bidder. If you’re going to invest in an isolate, you want custom designed GOURMET flavors. That is why MUTANT made completely insane flavors! Including Cookies N Cream, Triple Chocolate, Mint Chocolate Chip and Birthday Cake. Everyone knows that MUTANT knows flavors. Hell, we mastered them with our other products. So we’ve used all that knowledge to bring you the best tasting isolate on the market! * Percent Daily Values are based on a 2,000 aclorie diet. Your daily values may be higher or lower depending on your calorie needs. Whey Protein Isolate, Whey Protein Hydrolysate, Contains 2% or less of: Natural And Artificial Flavors, Sugar, Corn Syrup, Corn Meal, Palm Oil, Corn Starch, Citric Acid, Colors [Beetroot Red, Turmeric, Paprika, Blue #1]), Natural Cream Flavor, MCT Oil (Medium Chain Triglycerides from Fractionated Coconut Oil), Guar Gum, Sucralose, Lecithin, Silicon Dioxide, Lactase, Protease, Cinnamon, Stevia Leaf Extract (Rebaudioside A). CONTAINS: milk, soy (lecithin), tree nut (coconut). Produced in a facility that also handles ingredients from wheat, egg, peanut, sulfites, tree nut (including hazelnut). 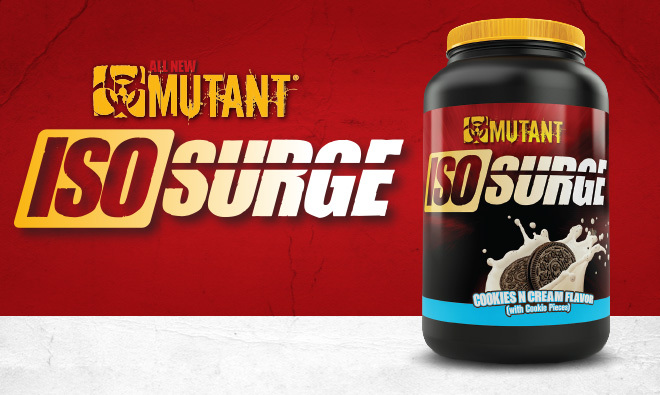 Directions For Iso Surge: Mix 1 scoop with 5-6 fl. oz. (150-180 mL) of water or milk. Warnings: This product is intended to be used to supplement the diet; not to be used as a substitute for a varied diet. A varied and balanced diet and healthy lifestyle are essential for good health. Do not use if packaging has been tampered with. Packed by weight, not by volume. Settling of product occurs after filling. KEEP OUT OF REACH OF CHILDREN. STORE IN A COOL, DRY PLACE.